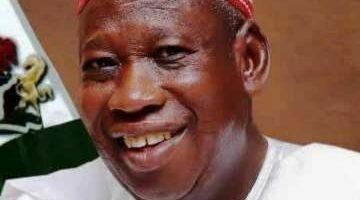 Governor of Kano state Abdullahi Ganduje said three million children are out of school in his state alone, stressing the need to curb Africa?s population explosion. Speaking at Royal Institute of International Affairs, Chatham House, UK, Ganduje noted that, population explosion in Africa is a reality and education is not matching up with population growth. ?One important factor that divides the population of the world into two is education, whether the population will be an asset, depends on education, whether it will be a liability also depends on education,? Ganduje said. ?It seems we are comfortable with the population of Africa; that Africa will be highly populated and that would be an asset, and therefore we would conquer the world. The 10 most literate countries in Africa; Seychelles, Equatorial Guinea, South Africa, Sao Tome, Libya, Namibia, Mauritius, Cape Verde, Botswana, Swaziland, Zimbabwe ? we all know that these are small countries. ?The governor, a University of Ibadan alumnus, who gave his thoughts on the theme of the event ?Higher Education and Demographic Growth in Africa? said the continent needs to engage in plans to improve infrastructure for the future, and also cut population. ?The population of students in Kano state now is over three million; the population of those outside the school system is also over three million. So if we are talking about Africa, we can confidently say the level of literacy is inversely proportional to population. Are we safe? ?The way our discussion is going on, it seem that we are working on the assumption that literacy level will be directly proportional to literacy level. So, I think we better examine these issues very very seriously. ?We said Britain has maintained a level of population for over how many years, and Nigeria, it is going further, and Africa, it is going further. But what are we doing? Since we don?t have the economy. ?Since the economy is weak, we will work on the infrastructural facilities no doubt, but we also have to control the other side. Otherwise, what is the meeting point? ?As we are now, we are complaining of lack of funds in other to improve the quality of education in Africa, and we have seen that the population will continue to increase, and we have not seen how our economy will continue to blossom, so I think we should examine the issue of population control in Africa.? In Nigeria, over 10.5 million children are out of school, according to UNESCO ? and this is the highest anywhere in the world. At 198 million in 2018, the United Nations projects that Nigeria?s population will double by 2050, to be the third most populous nation in the world, after only India and China.